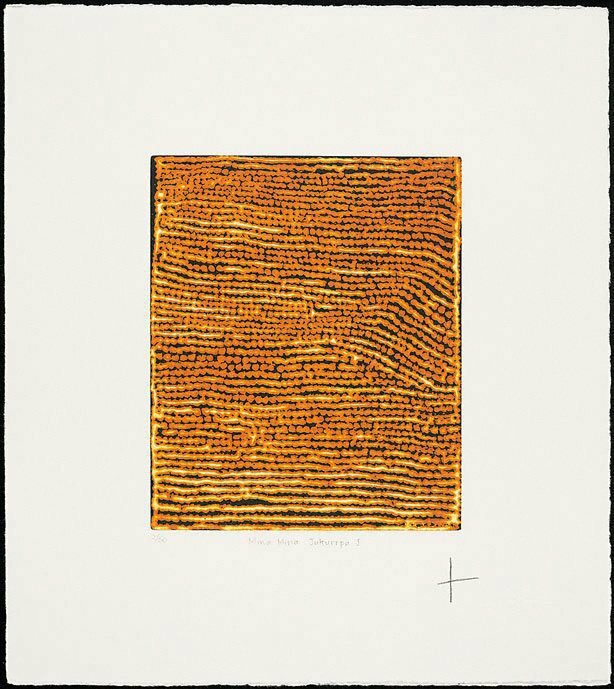 The 'Fire and Water Suite' 2003, an important set of 12 etchings was created in May 2003 at Warlukurlangu art centre at Yuendumu with printers from Northern Editions. Dreamings of the Rain Being and also the spectacular Warlpiri Fire Ceremony have inspired these exquisite images, richly imbued with ancestral symbols of lightning, rain, bushfires, waterholes and desert soaks. The etchings were created on zinc plates by some of Yuendumu's most significant artists and returned for processing by master printers in Darwin. The 50 Suites were officially launched late October 2003. From a remote location 300 kms north-west of Alice Springs a thriving art movement began at Yuendumu in the early 1980s. This community is close to Papunya which is recognised as being the birthplace of the contemporary Australian Aboriginal art movement. Over 30 years later this movement is acknowledged on the international art market as one of increasing global cultural significance. In the same way that Papunya artists translated ancient Jukurrpa (Dreaming) narratives and Kurruwari (designs) onto canvas with acrylic paints in the '70s and '80s so too did Yuendumu artists adapt to this modern means of artistic expression. Their talent as natural mark makers meant that printmaking was also an appropriate artistic medium so many senior artists were eventually taught basic skills in etching. In 2003 staff from Northern Editions at the Northern Territory University travelled to Yuendumu to conduct workshops in etching with senior artists at Warlukurlangu art centre named after the community's location in 'Fire Dreaming' country. The subsequent 'Fire and Water Suite' 2003 of 12 etchings further embodies the talents and traditional stories by significant artists of the area. Artists who contributed to this suite include Paddy (Cookie) Stewart, Judy Napangardi Watson, Paddy and Bessie Sims, Lucy Kennedy and Jack Ross. Etchings were proofed in the Darwin workshop of Northern Editions and approved by the artists for publication, marking another milestone in Yuendumu's history of artistic collaboration. The 'Fire and Water Suite' 2003 is a remarkable achievement and a great example of cultural adaptation and flexibility not to mention the extension of artist's skills. Signed l.r. beneath platemark, pencil "X". Not dated.